The perfect bite sized toy, Appeteasers will make every hour happy hour! 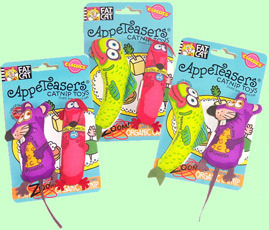 Just the right size for airborne fun, plus they’re satisfyingly stuffed with Zoom Around the Room organic catnip, making Appeteasers the toy that every kitty craves! Get ‘em while they’re hot!